The Pacific Meridional Mode, a coupled ocean–atmospheric interaction responsible for propagating subtropical anomalies to the tropics via thermodynamic mechanisms, features prominently in discussions of the response of climate variability to climate change. However, it is presently unclear how and why the variance in PMM might change, or even if greenhouse gas forcing might lead to heightened activity. Here, PMM variance over the last millennium is assessed in the Community Earth System Model Last Millennium Ensemble (LME). The model reproduces the main spatial characteristics of the PMM in the modern ocean in agreement with observations. With this basis, we assess the magnitude of the PMM variance over the past millennium, subject to forcing from a variety of sources. Internal (unforced) variability dominates the PMM variance in the LME, but prolonged periods of strong or weak PMM variance are found to be associated with characteristic spatial patterns, consistent across ensemble members and forcing experiments. The pattern of strong PMM variance features a cooler north Pacific, weaker Walker circulation, and a southward-shifted ITCZ. Comparison with a slab ocean model suggests that equatorial ocean dynamics are necessary to sustain the statistically significant multidecadal variability. With respect to the last millennium, present greenhouse forcing does not promote exceptional PMM variance. However, the PMM variability projected in the RCP8.5 scenario exceeds the thresholds expressed with the forcings applied over the Last Millennium. 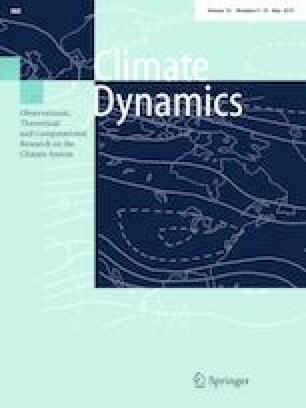 Aside from multidecadal variability, the model simulations also bear on ENSO variability and the sensitivity of climate variability to external forcing. The online version of this article ( https://doi.org/10.1007/s00382-019-04740-1) contains supplementary material, which is available to authorized users. The authors would like to thank two anonymous reviewers and the editor for their constructive comments. The authors would also like to acknowledge CESM1 (CAM5) Last Millennium Ensemble Community Project and supercomputing resources provided by NSF/CISL/Yellowstone. Salary support for SCS was provided by NSF14-59726, to CDC. AJM and DJA were partially supported by NSF (OCE1419306) and NOAA (MAPP, NA17OAR4310106). Support for DJA additionally came from the NSF Graduate Research Fellowship (DGE-1144086).